Trackside frontal three-quarter view of the Atchison, Topeka, and Santa Fe Railway Company's steam powered locomotive engine #3761. Visible is the Worthington water heater, which was installed in November 1946. The photograph was taken at the Los Angeles Union Passenger Terminal (LAUPT). 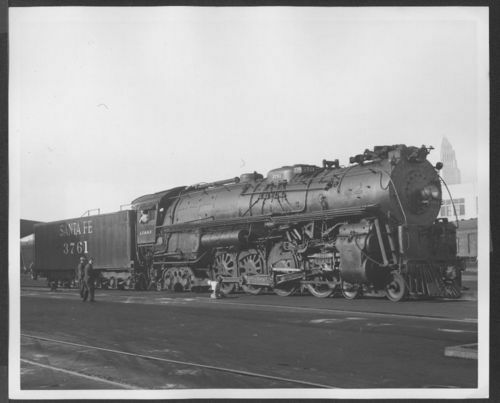 Atchsion, Topeka, & Santa Fe Railway Company's steam locomotive #3761.